California’s once-model higher education system has fallen into mediocrity. 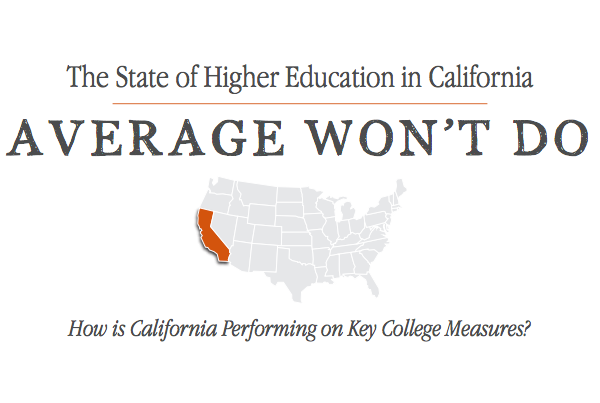 The latest report in our State of Higher Education in California series compares the state’s performance to the rest of the nation in six key college measures. The report, Average Won’t Do:Performance Trends in California Higher Education as a Foundation for Action, commissioned by the Campaign and produced by the Institute for Higher Education Leadership and Policy (IHELP) at California State University, Sacramento, analyzes ten-year trends in college preparation, affordability, participation, completion, benefits, and funding. The findings are mostly disappointing.